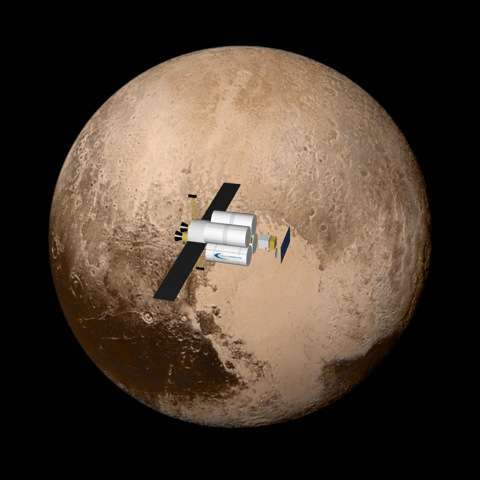 The next Pluto mission—an orbiter and lander? For decades, we could only imagine what the view of Pluto's surface might be. Now, we have the real thing. The images and data from the New Horizons' mission flyby of Pluto in July 2015 showed us an unexpectedly stunning and geologically active world. Scientists have used words like 'magical,' 'breathtaking' and 'scientific wonderland' to describe the long-awaited close-up views of distant Pluto. Even though scientists are still analyzing the data from New Horizons, ideas are starting to formulate about sending another spacecraft to Pluto, but with a long-term orbiter mission instead of a quick flyby. "The next appropriate mission to Pluto is an orbiter, maybe equipped with a lander if we had enough funding to do both," New Horizons' principal investigator Alan Stern told Universe Today in March. This week, Stern has shared on social media that the New Horizons' science team is meeting. But, separately, another group is starting to talk about a possible next mission to Pluto. But getting a spacecraft to the outer regions of our solar system as fast as possible provides challenges, particularly in being able to slow down enough to enable going into orbit around Pluto. For the speedy and lightweight New Horizons, an orbital mission was impossible. What propulsion system might make a Pluto orbiter and/or lander mission possible? A few ideas are being tossed around. One concept takes advantage of NASA's big, new Space Launch System (SLS), currently under development to enable human missions to Mars. 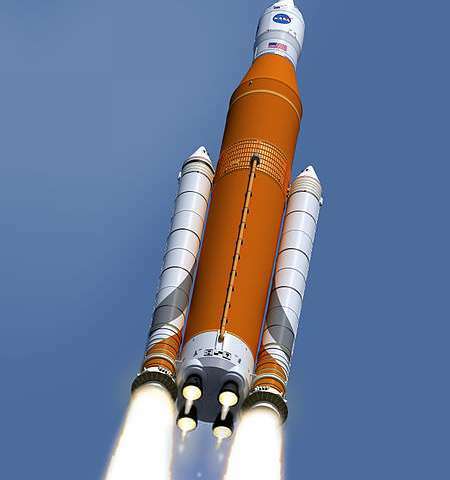 NASA describes the SLS as "designed to be flexible and evolvable and will open new possibilities for payloads, included robotic scientific missions." Even the first Block 1 version can launch 70 metric tons (later versions might be able to lift up to 130 metric tons.) Block 1 will be powered by twin five-segment solid rocket boosters and four liquid propellant engines, with a proposed 15% more thrust at launch than the Saturn V rockets that sent astronauts to the Moon. But an orbiter mission to Pluto might not be the best use of the SLS alone. It takes a lot of fuel to accelerate a vehicle to fast enough speed to get to Pluto in a reasonable amount of time. For example, New Horizons was the fastest spacecraft ever launched, using a souped-up Atlas V rocket with extra boosters, it performed a big burn when New Horizons departed Earth orbit. The lightweight spacecraft sped away from the Earth at 36,000 miles per hour (about 58,000 km/ hour), then used a gravity assist from Jupiter to boost New Horizons' speed to 52,000 mph (83,600 km/h), traveling nearly a million miles (1.5 million km) a day in its 3 billion mile (4.8 billion km) journey to Pluto. The flight took nine and a half years. "To enter Pluto orbit, a vehicle [like SLS] would have to boost up to that same speed, then turn around and decelerate for half the trip to arrive at Pluto with a net velocity of zero relative to the planet," explained Stephen Fleming, an investor in several alt-space startups including XCOR Aerospace, Planetary Resources and NanoRacks. "Unfortunately, due to the tyranny of the rocket equation, you would have to carry all the fuel/propellant to decelerate with you at launch … which means accelerating the orbiter AND all that fuel in the initial phase. That requires logarithmically more fuel for the initial burn, and it turns out to be a LOT of fuel." Fleming told Universe Today that using the multi-billion dollar SLS to launch a Pluto orbiter, you would wind up launching an entire payload full of propellant just to accelerate and decelerate a tiny Pluto orbiter. "That's an extraordinarily expensive mission," he said. A better option might be to use a propulsion system of combined technologies. Stern mentioned a NASA study that looked at using the SLS as the launch vehicle and to boost the spacecraft towards Pluto, but then using an RTG (Radioisotope Thermoelectric Generator) powered ion engine to later brake for an orbital arrival. An RTG produces heat from the natural decay of non-weapons-grade plutonium-238, and the heat is converted into electricity. 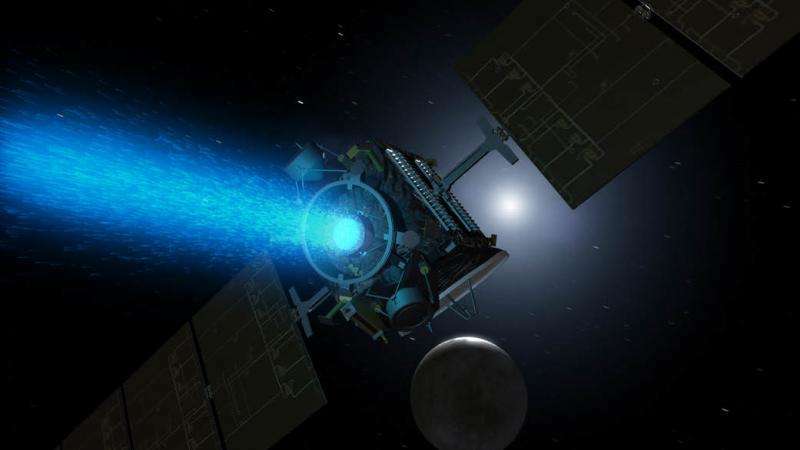 An RTG ion engine would be a more powerful ion propulsion system than the current solar electric ion engine on the Dawn spacecraft, now orbiting Ceres, in the asteroid belt, plus it would enable operation in the outer solar system, far from the Sun. This nuclear powered ion engine would enable a speeding spacecraft to slow down and go into orbit. "The SLS would boost you to fly out to Pluto," Stern said, "and it would actually take two years to do the braking with ion propulsion." Stern said the flight time for such a mission to Pluto would be seven and a half years, two years faster than New Horizons. But the most exciting option might be a proposed Fusion-Enabled Pluto Orbiter and Lander mission currently under a Phase 1 study in NASA's Innovative Advanced Concepts (NIAC). The proposal uses a Direct Fusion Drive (DFD) engine that has propulsion and power in one integrated device. 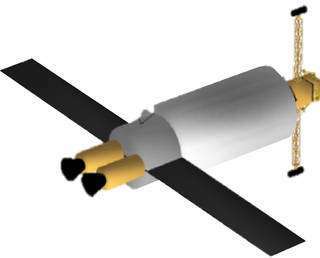 DFD provides high thrust to allow for a flight time of about 4 years to Pluto, plus being able to send substantial mass to orbit, perhaps between 1000 to 8000 kg. DFD is based on the Princeton Field-Reversed Configuration (PFRC) fusion reactor that has been under development for 15 years at the Princeton Plasma Physics Laboratory. If this propulsion system works as planned, it could launch a Pluto orbiter and a lander (or possibly a rover), and provide enough power to maintain an orbiter and all its instruments, as well as beam a lot of power to a lander. That would enable the surface vehicle to beam back video to the orbiter because it would have so much power, according to Stephanie Thomas from Princeton Satellite Systems, Inc., who is leading the NIAC study. "Our concept is generally received as, 'wow, that sounds really cool! When can I get one?'" Thomas told Universe Today. She said her and her team chose a prototype Pluto orbiter and lander mission in their proposal because it's a great example of what can be done with a fusion rocket. Their fusion system uses a small linear array of solenoid coils, and their fuel of choice is deuterium helium 3, which has very low neutron production. "It fits on a spacecraft, it fits on a launch vehicle," Thomas explained in a NIAC symposium talk (her talk starts about 17:30 in the linked video). "There's no lithium, or other dangerous materials, it produces very few damaging particles. It's about the size of a minivan or small truck. Our system is cheaper and faster to develop than other fusion proposals." The Princeton team has been able to produce 300 millisecond pulses with their plasma heating experiment, orders of magnitude better than any other system. "The biggest hurdle is the fusion itself," she said. "We need to build a bigger experiment to finish proving the new heating method, which will require an order of magnitude more resources than the project has been receiving from the Department of Energy so far," Thomas said via email. "However, it's still small in the grand scheme of advanced technology projects, about $50 million." Thomas said that DARPA has spent much more on many technology initiatives that ended up canceled. And it's also much less than other fusion technologies require for the same stage of research, since our machine is so small and has a simple coil configuration." (Thomas said have a look at the budget for ITER, the international nuclear fusion research and engineering megaproject, currently running over $20 billion). "To put it simply, we know our method heats electrons really well and can extrapolate to heating ions, but we need to build it and prove it," she said. Thomas and her team are currently working on the "balance of plant" technology – the subsystems that will be required to operate the engine in space, assuming the heating method works as currently predicted. In terms of the Pluto mission itself, Thomas said there aren't any particular hurdles on the orbiter itself, but it would involve scaling up a few technologies to take advantage of the very large amount of power available, such as the optical communications. "We could dedicate tens or more kW of power to the communication laser, not 10 watts, [like current missions]" she said. "Another unique feature of our concept is being able to beam a lot of power to a lander. This would enable new classes of planetary science instruments like powerful drills. The technology to do this exists but the specific instruments need to be designed and built. Additional technology that will be needed that is under development in various industries are lightweight space radiators, next-generation superconducting wires, and long-term cryogenic storage for the deuterium fuel." Thomas said their NIAC research is going well. "We were selected for the NIAC Phase II study, and are in contract negotiations now," she said. "We are busy working on higher fidelity models of the engine's thrust, designing components of the trajectory, and sizing the various subsystems, including the superconducting coils," she said. "Our current estimates are that a single 1 to 10 MW engine will produce between 5 and 50 N thrust, at about 10,000 sec specific impulse." Another futuristic propulsion possibility is the laser-based systems proposed by Yuri Milner for his Breakthrough Starshot proposal, where small cubesats could be zapped by lasers on Earth, basically "bug zapping" spacecraft to reach incredible speeds (possibly millions of miles/km per hour) to visit the outer solar system or beyond. "It's not really in the cards for us to use this kind of technology, because we'd have to wait decades just for this to be developed," Stern said. "But if you could send lightweight, inexpensive spacecraft at speeds like one-10th the speed of light based on lasers from Earth. We could send these small spacecraft to hundreds or thousands of objects in the Kuiper Belts, and you'd be out there in a matter of two-and-a-half days. You could send a spacecraft past Pluto every day. That would be really game changing." But even if everyone agrees a Pluto orbiter should be done, the earliest possible date for such a mission is sometime between the early 2020s and the early 2030s. But it all depends on the recommendations put forth by the scientific community's next decadal survey, which will suggest the most top-priority missions for NASA's Planetary Science Division. These Decadal Surveys are 10-year "roadmaps" that set science priorities and provide guidance on where NASA should send spacecraft and what types of missions they should be. The last Decadal Survey was published in 2011, and that set planetary science priorities through 2022. The next one, for 2023-2034, will likely be published in 2022. 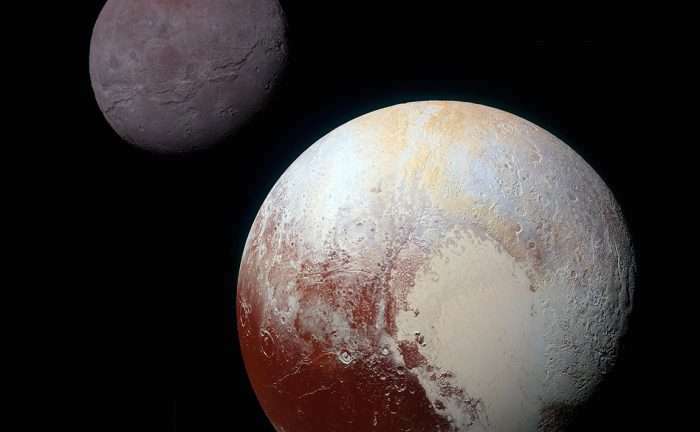 The New Horizons mission was the result of the suggestions from the 2003 planetary science Decadal Survey, where scientists said visiting the Pluto system and worlds beyond was a top-priority destination. So, if you're dreaming of a Pluto orbiter, keep talking about it. Solar sail would still be my choice. You don't run out of fuel and you get the most boost here near the sun where we need it.